St. Patrick’s Day and Lucky Clovers go hand in hand! Test your luck finding skills in our latest printable activity made just for this lucky Irish holiday. Print, color and count the four leaf clovers – how many did you find? 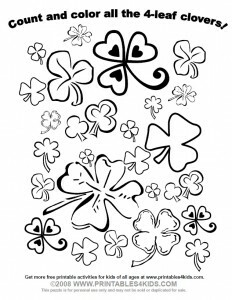 Click on the image above to view and print the activity full size or download the St. Patrick’s Day Lucky Clover Color and Count Activity as a PDF file.